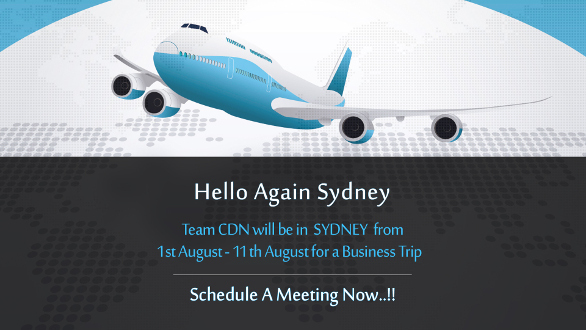 We are pleased to announce our Business trip to Sydney, Australia from 1st August to 11th August 2016. Our honorable directors Mr. Chetan Naik and Mr. Surajit Mitra will be visiting Sydney to meet some of our amazing clients from CeBIT Australia 2016 and also forge new partnerships. CDN Solutions Group offers innovative IT Consulting and Outsourcing services and solutions to varied industries and clients across the globe. Being in the market for 16 years we are a pioneer in providing web and mobile app development services on various technologies. We have provided our services across 32+ countries and have a record of 1400+ projects with 230+ manpower. So, if you are in Australia and looking for experts in Enterprise, Web and Mobility Development for your business, then do SCHEDULE A MEETING with us. We can prove to be a profitable outsourcing partner to your business.